All right folks, I've got a simple summer cocktail recipe for you tonight. We picked up a juicy watermelon yesterday and thought, I bet this would be good with Dragon Berry rum. Yup. It is. 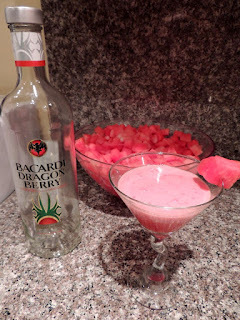 Put the watermelon and rum in a blender and blend thoroughly. Pour into a martini glass and garnish with watermelon.